For these reasons, we have decided that there is a place for a crossdreamer group within SL to serve as a meeting place to find friends and kindred spirits. To ensure that this community is tolerant, engaging and aligned with our core focus, we will offer membership by invitation only. We are searching for new members at crossdreamer forums to find those who are already curious and serious about crossdreaming, so as to keep the goals of the group aligned with the concerns and desires of our community. We hope that all who have already found solace in SL will join us, and those who are curious will take advantage of our offer of friendship to come and explore with us. We will make our virtual world better by making your acquaintance." (Click here for full text). Crossdream SL is an invitation only group. 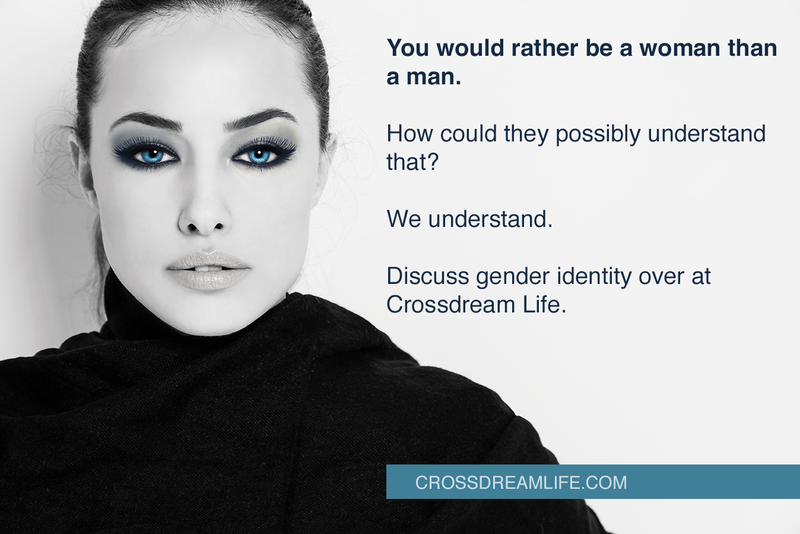 To the group, you must sign up as a member of Crossdream Life, and send a private message to Sienna Blau. She will guide you along. If you are already an active Second Life resident, You can also send an instant message to Sienna Blau (username SentientBlue) in Second Life. She will respond with a group invitation. "If you are not yet a resident, but would like to join us to explore in world, drop me (Sienna) a PM at CDL and let me know what times are good for your exploration. If I can't join you at a good time, I will ask one of the other members, who will be happy to be your hostess." Second Life has been a huge, wonderful, powerful venue for exploring crossdreaming in myself and others. I highly recommend it. If you're inclined to try, I'm happy to be a resource too: IM Kaseido Quandry within SL. Huge kudos to Sienna for her work organizing this group - I'll be joining up tonight!